Recumbent bikes can be extremely beneficial to those who suffer from back aches and weak knees. Their unique design provides comfort and safety while delivering effective workouts that strengthen the muscles of the legs and protect the knees. While recumbent exercise bikes are relatively easy to use, given the stiff competition in the market with many different models on display, it can be difficult to pick the right one. To simplify the buying process and make it easier for you guys to get the right bike, our team of professionals has tested several of the top models for safety, comfort, ergonomic design, workout effectiveness and overall user-friendliness. In our recumbent bike reviews, you find a clear and concise picture of what the best recumbent bikes on the market have to offer. Looking for the best recumbent bike for your home, our recommendation for 2019 is the Sole Fitness R92 Recumbent Bike. Be it a small workout or those long workout, you will never complain of back aches or pains that you usually would with others. However, on the hand, if you don’t want to spend that kind of money, and you’re on a budget, we recommend the Exerpeutic 900XL Recumbent Bike. But, before you take this decision of getting a bike for your best workout, we want you to understand your needs and preferences, as they will help you decide which bike model is best suited for you. We’re sure that some of you out there have decided to workout on the best recumbent exercise bike for the first time and are very excited about it. Well, I would ask you to keep your excitement alive and do not get messed up in the decision making because this article is to help you to decide which bike will be best for you. The stationary recumbent bike you have been planning to buy has many advantages. First and foremost being, it can be used indoors. I’m sure it must have crossed your mind, why should you buy an indoor bike when you have the option of outdoor activities like running and jogging. The answer can be tricky, but I’m going to make it simple and straight for you. As good and healthy outdoor exercise activities can be, it doesn’t benefit you with the technological touches that are inbuilt in a recumbent exercise bike. The bikes are very carefully and beautifully designed to provide you with the maximum benefit of the workout. Wondering what kind of features makes the bikes so appealing? Read our stationary recumbent bike reviews to get detailed information on special features. They are small but important things like offering increments of increased resistance and having you maintain body positions that are more favorable for your comfort, hence making them very efficient. Perhaps the greatest advantage of the best recumbent exercise bikes are their superior ergonomic design. While most other indoor bikes, such as spin bikes, and upright bikes are built for the seasoned athlete who have many hours of cycling under their belt, the recumbent stationary bike is truly the beginners bike. Anyone can benefit from using the stationary recumbent bike, irrespective of age, weight or even certain types of physical ailments. The bikes is designed to support the back and protect the knees while delivering effective workouts. The design completely eliminates any and all risks associated with cycling, so that people can focus on the stuff that really matters, whether that is weight loss or achieving a greater level of fitness. These bikes effectively address the risk of injury due to bad posture over extended workout sessions as well the strain on the knees from detrimental positions. Overall, the design of recumbent exercise bikes support effective workouts while protecting the parts of the body that are vulnerable to injuries associated with cycling with poor posture. Now, I would like to familiarize you with their advantages over other gym equipment that might attract your attention. Running on a treadmill is no different from running outside, the disadvantages remain the same, be it with your posture or your knees, it will end up hurting you. Even regular cycling bikes have the same impact. However, the best recumbent exercise bikes completely eradicate this problem by encouraging the use of proper cycling posture that gives you a complete workout without any aches or pain. We are very well aware of the spacing issues some of us face because of small houses. If you live in a bungalow, this shouldn’t be much of your concern, but if you are living in a regular apartment, then spacing is on your priority list. Folding recumbent bikes can offer the perfect solution. After an effective workout, all you have to do is simply fold your bike and store it where ever you like. Either under your bed or in your closet. Folding recumbent bikes are also easy to move because of their lighter weight.. To get all the latest information on the best foldable bikes read our recumbent reviews 2019. Whether you’re considering a Marcy, Schwinn, Exerpeutic or a Reebok, we leave no stone unturned. All the top brands are covered in our reviews, because we only believe in providing the best value to our readers and customers. There is something for everyone. Whether you’re on a budget or you’re looking for a recumbent stationary bike with fascinating features, we bring you the best of knowledge and information, so that you can make a proper decision and get the product that suits you the best. We have a dedicated team to review all the bikes to put forward a comprehensive review of each product. We give you a candid feedback. Now you are well aware of the various advantages recumbent exercise bikes provide you. You must be equally excited to purchase one to meet your fitness goals. But the fact is, you have to have a very clear-cut idea of what you want to buy to avoid confusion. In doing so, you should know those things that you should keep in mind before you make your purchase. Ergonomic Design: Without a good level of comfort and safety on offer, you might as well forget about recumbent bikes entirely. 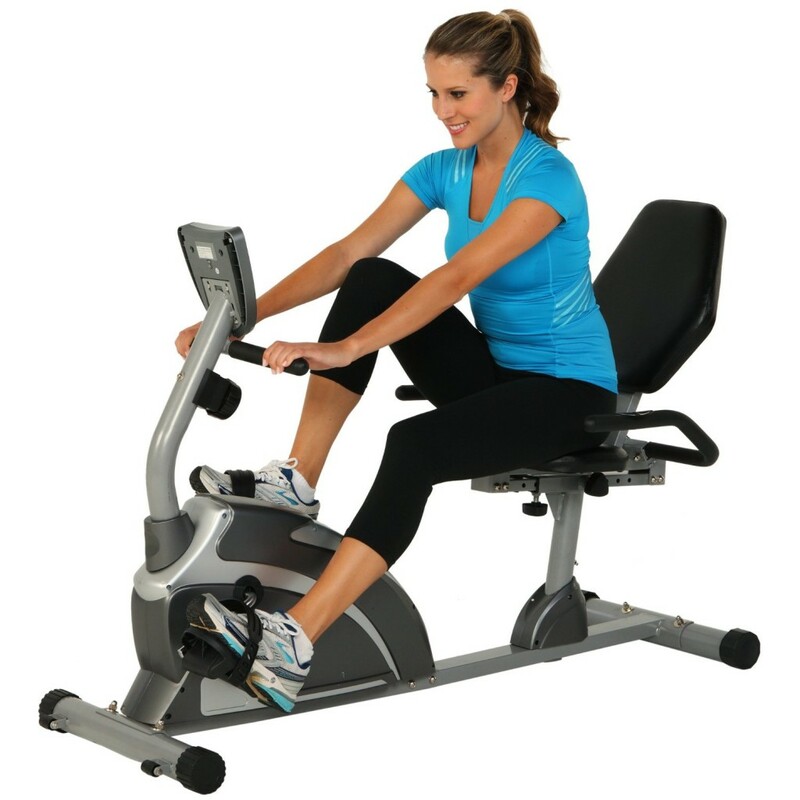 Safety and comfort are the hall mark features that separate recumbent exercise bikes from all other indoor bikes. They are designed to keep your body in a semi-horizontal position to you relax while you cycle. Besides supporting proper and comfortable cycling posture, their design also distributes body weight evenly so that you maintain proper posture during long exercise periods. For even greater support, you can get padded seats and lumbar support if you have severe back pain. Workout Effectiveness: While safety, comfort and ergonomic design are a priority, choosing a recumbent that offers a great workout should be your second top priority. After all, what is the point of owing an exercise bike if it doesn’t offer effective exercise. There are a wide variety of stationary recumbent bikes; all with varying exercise features. While it goes without saying that the more expensive models offer the best features, you can easily find a mid level bike with all the essential features to help you enjoy an effective workout. So what are some essential features that you should consider without getting too fancy and blowing out your budget. For starters, you definitely want a bike with a decent LCD and computer. A good level computer will track calories burnt, speed, distance, and time. If you want hear rate monitoring, you might have to pay a little more, but in our opinion it is well worth it. The hear rate is a great indicator of workout effectiveness, since higher heart rates are directly indicative of more calories burnt. Being able to monitor your heart rate and see when you’re nearing your heart rate max can tell yo when you need to increase resistance or decrease resistance as well as give you the extra motivation you need to successfully complete your workouts. Now, lets look at the ‘fancy’ stuff that comes with only the best recumbent exercise bike models. 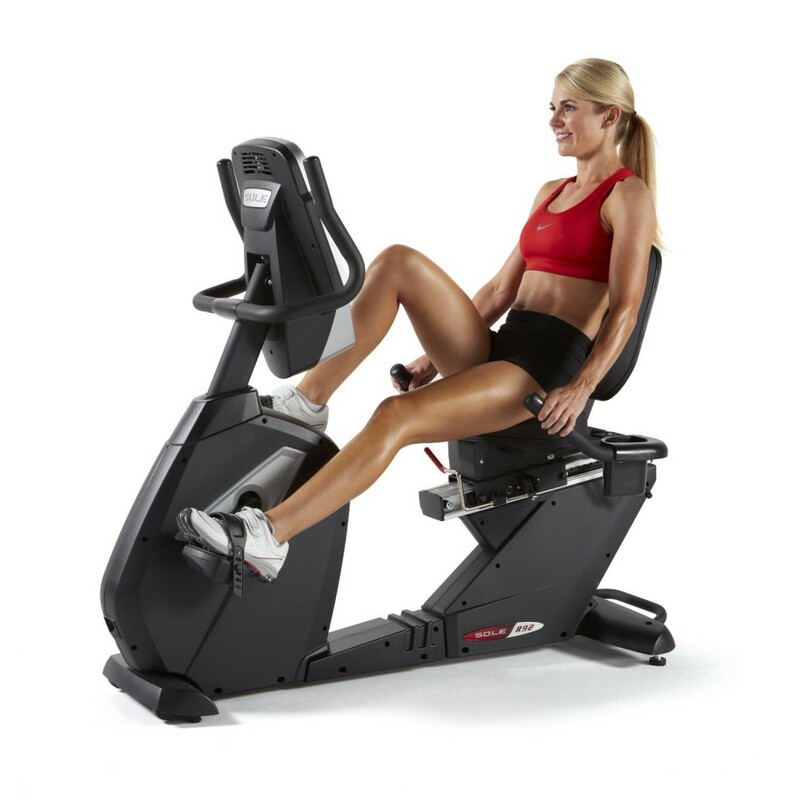 The recumbent stationary bikes have built in computer simulated versions of your fitness professional. 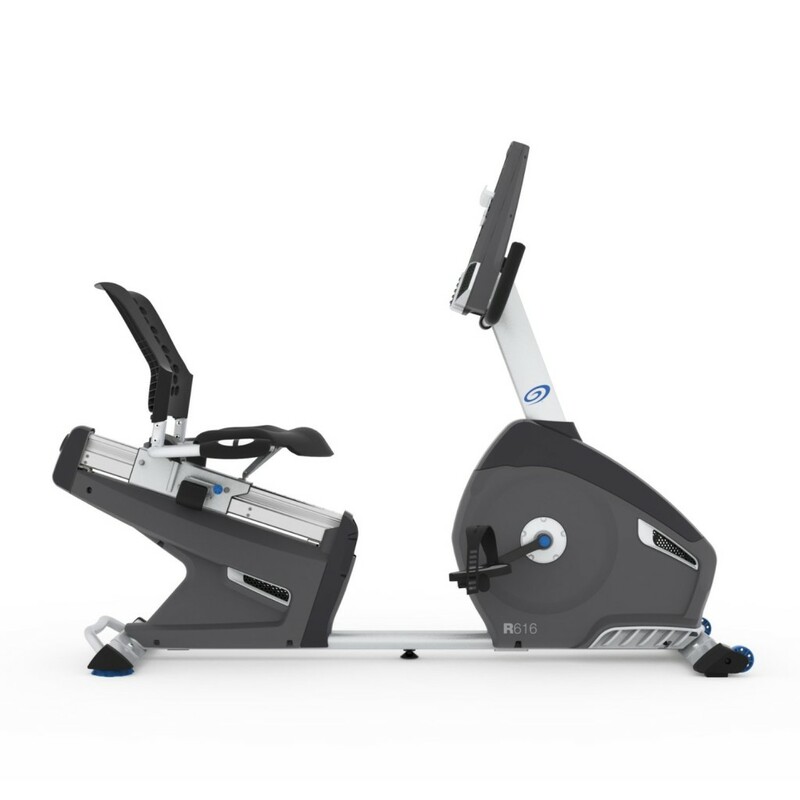 These recumbent exercise bikes come installed with customizable workout options, so that give you have functionality to design your unique workouts by taking into consideration your weight, height, age, exercise intensity and workout goals. Also, if you love your music while working out, some top models even come with built-in speakers and ipod connectivity so that you exercise to your favorite tunes. Space: You definitely need to make sure you have the room to accomodate an exercise bike. If you live in a small apartment, space can be an issue. Your best bet is a folding recumbent bike that you can store without effort, eitherunder your bed or in a closet and take out whenever you need to workout. You don’t want a recumbent exercise bike that occupies maximum space in your room and becomes a hurdle that you have to cross every time you walk through your apartment. Thus, you need to consider the space available before you select a specific model of the bike. Price: We all know, we do not have the same budget. Some like to save, and others like to get recumbent stationary bikes with loaded features. If you are the saving type, then you will be looking for something that’s economically reasonable and cost effective. I would suggest you to go for the cheaper ones that do not have additional fancy feature but gets the job done well. On the other hand, if you do not mind spending money, then you have many bikes waiting for you with those added beneficial features. You make the best purchase when you maintain a good balance between what you want and what you can afford. Get the latest information on the best recumbent bikes with our recumbent bike reviews 2019. The best Recumbent exercise bikes are a little on the costly side over the regular bikes because they mainly focus on providing comfort along with the results. The fitness industry very well realizes that everyone has their budget, therefore, now they are offering recumbent exercise bikes on a varying range of prices. Due to this, I hope, to help you in making your choice, I have managed to compile the best and the top most stationary recumbent bike reviews for every budget. But, please do keep in mind that as the prices vary so do the features. Top end recumbent stationary bikes can cost as much as $1000. If you are looking for a bike under $200, then our top pick is Exerpeutic 900XL. The bike has all the features that are required. The bike a very low-end model and doesn’t come with fancy features, but provides you with all the base essentials. One of the most impressive qualities is the wide maximum capacity of 300 pounds, which proves to be impressive for such a light model. Bike comes with a recumbent seat, which provides you maximum comfort. Nevertheless, it has a timer, distance counter, calorie counter and few resistance levels. Yes, it is not too much of a variation as any other bike provides. However, if you are looking for a bike for an entry level and one that doesn’t require too much of an investment, then it is the one for you. Bike comes with a pulse monitor that helps you monitor your workout levels. There’s also a “step thru” technology, in which you can simply step on and off instantly thus offering you a comfortable workout. The model comes with a leg stabilizer, which prevents any bad movements while you are exercising. Assembling of this bike has no issue, as it’s a child’s play to assemble the bike. Plus, you will be done in no time. This bike works as smoothly as you think it can, the reason being its flywheel and V-belt drive. Whether it’s that music you are listening to, watching over your kids, you will be able to do the exercise without any extra added noise. Cushioned seat and the pedals are large ensuring no slipping of the foot takes place while you are paddling. If you can stretch your budget a bit to $500, then out top pick is ProFrom 315CSX. Bike comes with some more advanced features than mentioned above. This ProForm Recumbent Bike is a durable bike that will keep you interested and more challenged. 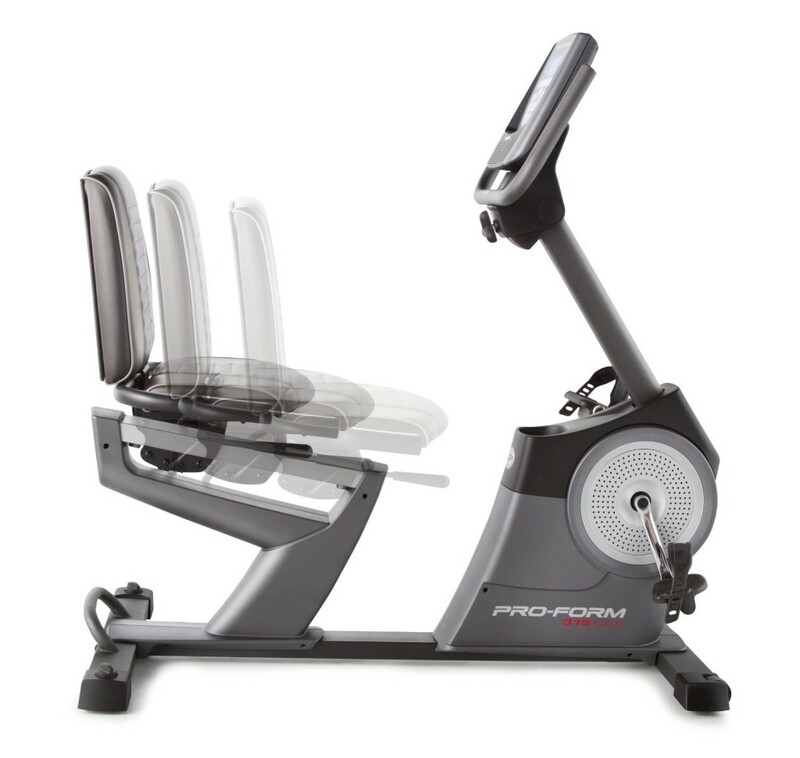 ProForm offers you a great recumbent bike with the effective and regular workout. 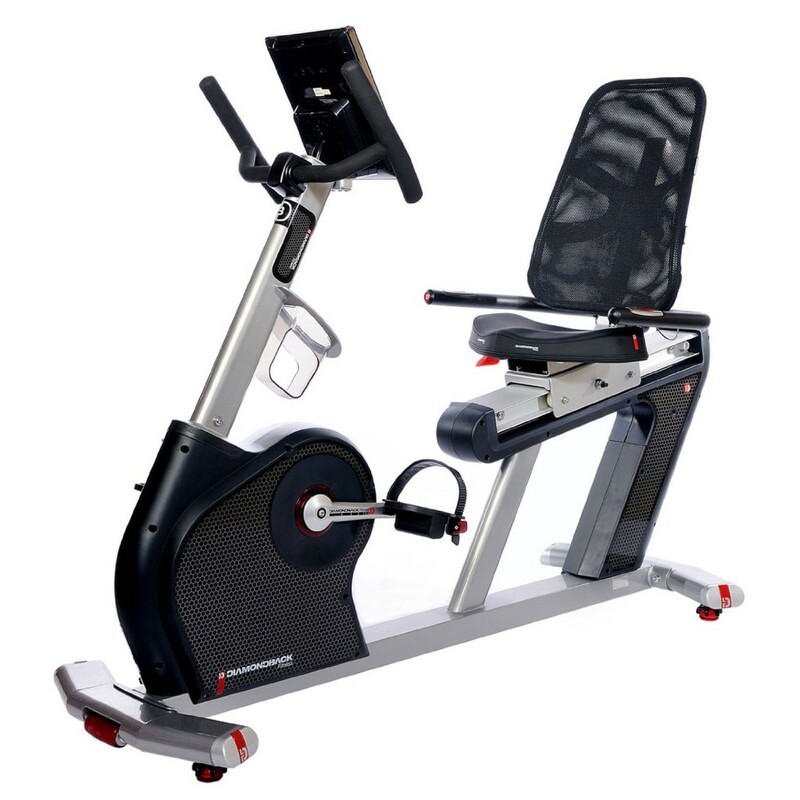 Along with the recumbent design, this ProForm Recumbent Bike comes with a large display, customized workouts, heart rate monitor, iPod connectivity and iFit, giving you more motivation to work out. Though, iFit comes with an additional subscription; it is worth the cost as it comes along with Google maps. If you are one of those who think money has no value in front of fitness then out top, pick Diamondback Fitness 910Sr is ideal for you. Read below to know about its main features. The model is one of the high-end models, and this is so justified because the bike provides many additional features that attract many customers. Wondering what that is? The bike offers you a wireless heart rate monitor, with a strap that is strapped to your chest telling you the exact real-time information on your LCD. This new feature is important because other models provide you with this information by measuring your pulse rate via sensors on the handlebars. Another amazing feature is the 30 pin connector designed especially to connect your Apple devices. Other bonus points are meshed back seat that is proven to be much more comfortable, and the ability to fold away magazine rack makes this our top pick. Need not say, this bike provides you many levels of resistance and workout programs. As we know not only lightweight, and easy transportation is the important factors, but storage matters too. We all look for a bike that is easily mobile, light to carry and easy to store. There are varieties of bikes available in the market that cover all these three features. The bike is the younger version of the LCR commercial model; it has many features of its big brother at a much lower price. The bike came with a recumbent seat and improved back support that intern gives you the comfort level you always wished for in a bike. Be it a small workout or those long workouts, you will never complain of back aches or pains that you usually do in others. Are those bad knees, keeping you reluctant to have a good workout? If you are concerned about back pain, joint pain or any other chronic for your body, you should be tension free now. We have the ultimate solution for you which will not only help you find relief but also give you a good workout, Nautilus R616 recumbent bike. Nautilus R616 Recumbent Bike This bike is the perfect mash of style and features. This premium bike has Bluetooth connectivity for syncing your data with Nautilus Connect and MyFitness pal. Along with this, this also features a dualTrack display with two high-resolution blue-blacks lit LCD monitors, which can be covered by your tablets or magazines, but you can still see your results. It comes with 25 levels of resistance, 29 workout programs, the MP3 input port and USB media charging feature. There is ventilated back support with a padded seat, adding to the level of comfort you have longed for in your bike. Once you know what your requirements are and what you are looking for in your bike, it won’t be a difficult decision for you to make. We have selected and reviewed all the best models in our recumbent bike reviews 2019. The essentials remain the same. The difference comes only in the warranty, programs provided resistance levels and other basic amenities like water bottle holder and fan. Nevertheless, all bikes of all ranges will provide you the determination you need to work out and maintain that health. Keeping in mind all the important factors like the money you are ready to spend and space you have, take an informed and analyzed decision because this investment will last you for years.